You are familiar with skateboarding and snowboarding, but what about salt boarding? 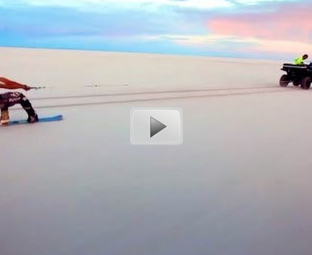 This sport requires a snowboard, four-wheeler, rope and beautiful salt flats. After strapping yourself onto your board, you can be pulled at high speeds across the salty terrain. This video was filmed at the Utah Salt Flats. And many of the people were being pulled at 50 miles per hour. What a rush!